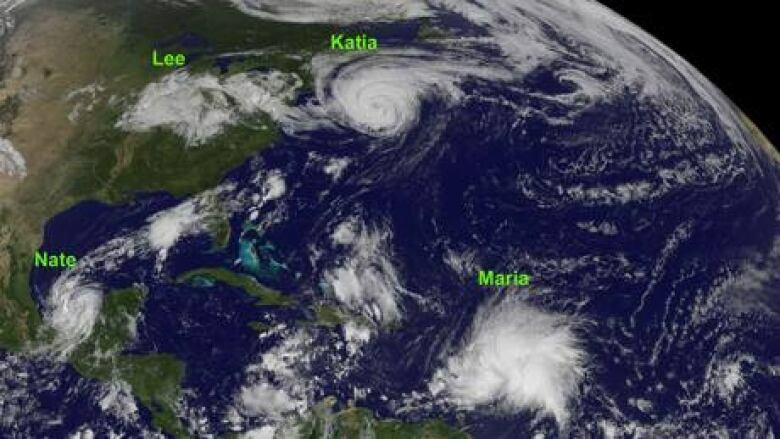 Tropical Storm Maria is expected to bring heavy rain and strong winds to Atlantic Canada and hit eastern Newfoundland the hardest, according to The Canadian Hurricane Centre. On Wednesday morning, Maria was about 900 kilometres south-southwest of Bermuda, with winds blowing at about 90 km/h The centre’s forecasters say it’s difficult to say where the storm will travel. "Forecast is highly uncertain, even two days away," the centre said in a statement issued Wednesday morning. "The probability of winds directly from Maria is greatest for eastern Newfoundland but it it equally possible that the wind from Maria passes south of Newfoundland." Rainfall is expected to occur over many parts of eastern Canada on Friday, even if Maria dissipates and moves well to the south. "However if Maria and its tropical moisture fully merge with a cold front that is expected to move into the area, the potential for the heaviest rainfall will be over eastern Newfoundland," according to the centre. "Fifty to 75 millimetres is certainly not out of the question, as we see it at this point." The centre said gale and possible storm force winds can be expected around Atlantic Canada on Friday.